I was thrilled when Amanda invited me to photograph her 50th birthday celebrations in December 2012. I really enjoy photographing special events, there is a real sense of excitement in the air and I love the challenge of capturing that in the photos. The party was held at Ridgmont House, Horwich. Built in the 17th Century, Ridgmont House is a charming building full of character, set within its own private grounds. It is a fantastic venue for parties, weddings and events. Amanda’s party was held just prior to Christmas and everyone was in great spirits. The house began to get busy at around 8pm, there was a great atmosphere and it wasn’t long before the DJ started his set. The room was buzzing – lots of chatting, laughter, dancing and of course great food and drink! Amanda looked fantastic in an elegant long black dress. Everyone had a lovely evening and I really enjoyed photographing the event. Thank you Amanda for allowing me to be part of your celebrations and also thank you to the staff at Ridgmont House who were particularly helpful too! 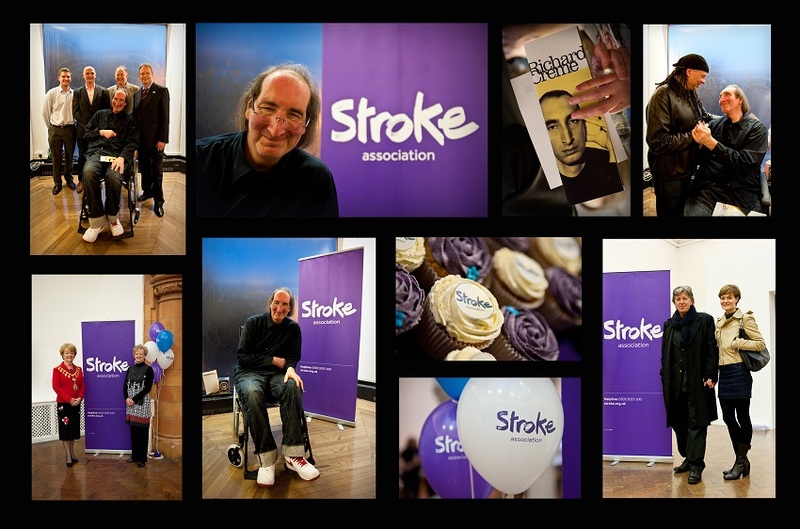 Last week, I was approached by the Stroke Association asking if I would like to be official photographer for the launch night of Richard Creme’s art exhibition in Manchester. Of course I jumped at the chance! Richard Creme made quite a name for himself on the Manchester scene back in the day! For those in the know, Richard was the ultimate style icon and fashionista, running the exclusive L’homme boutique, dressing the likes of David Beckham, Prince and David Bowie to mention but a few. He was the epitomy of cool in Manchester and was regularly spotted hanging out at the infamous Hacienda, always flawlessly turned out and envied by the masses! Sadly, Richard Creme suffered a major stroke in 2007 at the age of 50. This was to change his life significantly – the stroke had a major impact on his ability to speak and he lost the majority of movement on the right side of his body. He found himself unable to continue his business and understandably faced some very difficult times trying to come to terms with his future. Fortunately however, Richard found solace in art. Despite being right handed, he began to draw and paint using his left hand and over time, began to produce some very impressive pieces. Five years after his stroke, Ricahrd is proudly exhibiting his work at Manchester Metropolitan’s Link Gallery as part of The Stroke Association’s “Action On Stroke” Month, supported by Arts For Health. The launch night was a fantastic – guests included the Mayor of Trafford, Leroy Richardson (previous manager of the Hacienda), Colette Walsh (journalist and broadcaster) and Irfan Rainy (DJ and producer). I really enjoyed photographing the event. You can also watch the official footage of the night here. If you would like to support the Stroke Association by making a donation, please click on the link to visit the donation page.